Small to medium sized businesses and larger companies usually invest capital in some sort of customer relationship solution. It is important the information relating to the client is well organized and easy to access. Likewise, individuals (and many smaller businesses) also employ contact management at some level of sophistication. Challenges arise for some when time or money are invested in developing contacts via any of the wide variety of social media communities. Sign up for account at the likes of Twitter, Facebook, MySpace, LinkedIn, etc. Agree to have the social site automatically search for friends, followers, or network members. Perform searches for new contacts and add them to the existing, growing list of existing contacts. Spend hours, days, and months actively recruiting new contacts. Decide it makes business (or personal) sense to use that newly acquired contact data for some sales or marketing purposes. Discover all the time, effort and energy devoted to contact aggregation for many of the social communities has been for naught since many of the terms of service prohibit members from harvesting contact information. Wonder what the heck to do now! In reality, the next step, should have been the first one taken. Consider focusing all of ones time and efforts in the area of contact management with the social community found at LinkedIn. This community is more business focused. One adds people to their “network”. Serious folks looking for their connections to make sense in a financial, business oriented way. LinkedIn is one of the very few communities which allow its members to export the contact data of all followers of their account. If those two reasons aren’t enough, how about a third? The easy to find link to export ones LinkedIn contacts can be found right here. The folks at LinkedIn provide for their users the ability to export in the following formats, depending upon the contact management service they prefer. Even though most users of the LinkedIn site tend to be more business oriented, various other social media communities are spawning sub-groups that essentially focus on business, marketing and other activities outside the tradition social environment. Twitter recently added a feature to their service called Lists. Exactly as it sounds, the List feature provides users to create highly focused groups of like minded individuals. Many business and industry oriented lists have been created over the past year or so. Likewise, Facebook provides its members with the ability to create pages for their business. While the site technically does not allow for individuals to also open a separate business account, there are ways around this rule. If one doesn’t mind associating what Facebook refers to as a fan page, with their personal account, it is quick and easy to create a place on Facebook for the business to be found. If having the personal and business is not acceptable, simply log out of the personal account, create a page and when asked for an email address to log in, provide one different from the address associated with the personal account. Now, effectively, there is a page without an account. From there it can be easy and fun to collect followers, or fans of the business. But what to do with those folks? Other than appealing to them via the Facebook page, there is really not much which can be done. This is not to say time and effort should not be put into collecting a following from that community, only that one is limited with the follow-on marketing efforts. 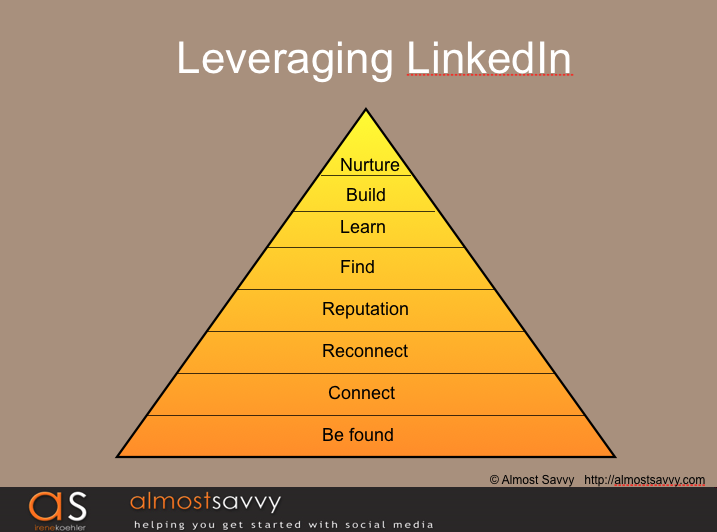 It is best to cultivate the community and make it easy to migrate from the Facebook page to the LinkedIn profile. Once there and accepted as a member of the network, the business or individual has the ability to easily export that contact information opening up many more avenues of contacting abilities. This guest post is by Sidney Angelos, a writer for a All Things CRM which covers CRM trends and social media for customer relationship management. Great information, thanks. I am now starting to focus on building my social and internet links so your post is very useful to me. Hi Sidney, great insights about LinkedIn. LinkedIn is great for business networking and sharing interesting resources with people in the same business and niches. One of my favorite online networks. Linkedin is definitely the way to go, when building a list. Too bad there are so many potential consumers who only use fb and not linkedin. Google+ should be in this list now as well. Google+ makes it very easy to manage the contacts. I think the internet is the best choices when it comes to letting people know about your business considering that almost everybody has access. Facebook, LinkedIn and Twitter. Those three SN sites are very useful for our business and we are focusing our attention and efforts to them. You’re right, the difference of LI between all the other SN sites is that almost all members have Professional Careers. Sometimes we find our customers their which are Small Business Owners and provide Funding services for them. Thanks for this information, Gail. Though I have a Linkedin account, I don’t spend so much time in it. For that reason, I am not aware of this particular feature in Linkedin. I must say, this is really efficient for contact management. I use LinkedIn for my business because in my eyes it is more serious than Facebook or twitter. but i also use facebook. I’m also member of LinkedIn, but I must admit I have been quite passive. Your post really takes it to the next level – thanks for sharing! I have used LinkedIn basic account for months now and found it so much easier to connect with colleagues, friend’s from my last companies and open networkers. I was wondering if getting a LinkedIn premium account is worth the money. I use LinkedIn for my business because in my eyes it is more serious than Facebook or twitter. Hi Sidney, You made a great point about losing all your contacts if FB deletes your page vs. if LinkedIn does and I do the exact same thing with Twitter, one acct. is SEO business and the other one is personal. So very true! Of all the social media communities, linkedin stands out as being the most business like in interest. I guess starting off by asking about current and past jobs immediately puts one in the mindset of business and business networking. I use linkedin mainly to grow my business connections and facebook for my personal contacts (Except the facebook page which I created for my blog). I will check out contact management in LinkedIn. I have been using LinkedIn for nearly 6 months. I have found that LIONs can bring in a lot of connections. I too like the import feature. If I remember correct, one can send upto 3000 invitations with a new account and if one wants to increase this limit, they have to mail customer care. Thanks for the useful info, Linkedin is a great resource. One which ive been using for many years now, and it has certainly helpedme to interact with my customers allowing me to build strong relationships with them. Thanks for the info. I think linkedin can be a great way to network with other businesses and clients. Having a professional environment to share business interests is a great way to gain industry knowledge and connections. I’ve been meaning too, every time I sit to spend some time with it, something always pops up. Dennis Edell would love you to read ..A Gravatar Now Needed to Comment! Yeah, it’s easy to get distracted online. I see a new email or tweet alert, and I’m off on a new tangent! Linked In has always been an excellent source for business professionals! I even use it to do my recruiting. This is great – I use LinkedIn now for years and did not know that. Thanks a lot. I agree Sidney, having multiple Twitter accounts allows people to segment their followers by campaign and do cross association. We have a LI page and I challenge/follow the Analytics on both to show how effective we are or are not being at the time. I did not know you could pull your contact list from LI; I appreciate that tidbit. I absolutely use linked in to keep track of contacts in my professional network. As a financial consultant I have relationships that I use for client referrals from all over the country. Say I have a client who lives in Florida in need of a bankruptcy attorney. I can pull up linked in and see if I have already connected with any attorneys in Florida that might be close to my client. I use sales force for all of my clients, but I find Linkedin suits my purposes great for keeping tabs on my growing network. Damon would love you to read ..Dave makes Thousands Screwing Consumers- way to go Dave! Good to hear it’s working well for you Damon! 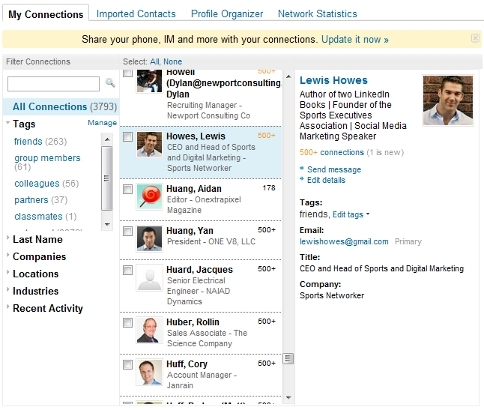 It’s great to be able to pull your contact information from LinkedIn and import it into contact management software. Yes, and for a professional, I think a linked in profile and network is a must. Facebook and twitter are great and have awesome features, but with linkedin, you are basically focusing on networking with other professionals, which in most cases is a much different type of networking than you would do on say facebook. I really like Linkedin! I was skeptical at the beginning and only used Facebook, but then I tried Linkedin and now, I have maybe three or four new clients that I would never have found an other way! I have ended up on linkedin a number of times, but never really got much out of it. I don’t have an account so I guess I am sometimes limited to what I can see. What I do sometimes see is just business contact info, resume/previous work experience, and that type of thing. So it never really appealed to me that much. Unless there is more to it that I am missing. I guess I really don’t understand the benefit of how or what linkedin can do for someone. Yes, you have to have an account and some contacts before you can see the real benefits of the network. I think that even if you aren’t looking for a job or professional connections, you can do a lot for your reputation by answering questions in the answers section, participating in groups, etc. Wonderful thoughts. One way to promote and boost business by gaining followers that can be a prospect customer’s. I actually want to gave it a try now! Yes. That and if Facebook decides to K/O your fan page, you’ll never get those contacts back. If LinkedIn decides to K/O your profile, you can at least still have your contacts to reconnect with if and when you sign up again. Its a plus to be able to take friends with you as you go, because most social site house your contact and you can’t take them unless you add them to a email list or something. Exactly. At least LinkedIn lets you have the contacts you make and not imprison the information in their system only. Thanks for all of the information, especially for sharing the link to export your LinkedIn contacts. I don’t claim to have used LinkedIn all that much, so I wasn’t familiar enough with it to know that this was even possible! Thanks for sharing!